A file photo of A worker holding steel rods at a factory belonging to Ezz Steel, Egypt's largest steel producer, at an industrial complex in Sadat City, 94 km (58 miles) north of Cairo, April 17, 2013. Egypt's Ministry of Finance says it has started collecting "temporary protection fees" of 25 percent on steel rebar and 15 percent on iron billets for 180 days starting Monday. The decision aims to increase production and sales from the local industry, support Egyptian industrialists, and enhance Egyptian exports and create jobs for the youth. The ministry said that the fees will be placed into the account of the Export Development Fund (EDF) at the Central Bank of Egypt. 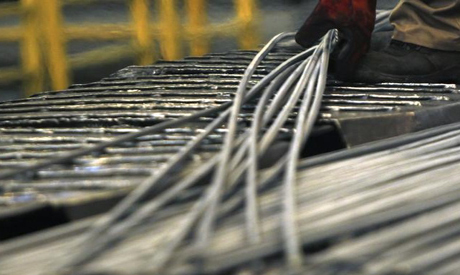 In August 2017, Egypt raised the price of steel rebar by more than 12 percent, compared to 10.5 percent in 2016.